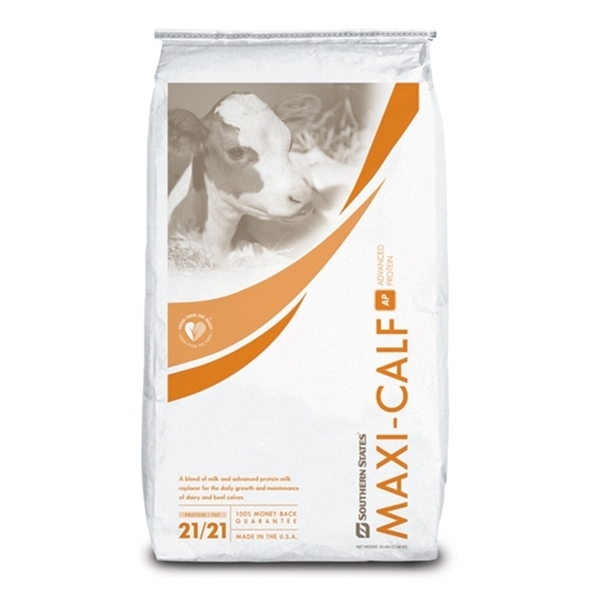 Southern States Maxi-Calf AP with (BVT) Medicated is an economical milk replacer containing a unique blend of milk and advanced proteins for the daily growth and maintenance of calves. It contains Bovatec® for control of coccidiosis and should be fed to dairy calves from birth to 5-7 weeks of age. Maxi-Calf AP Supplies similar amino acid composition to all-milk milk replacers and contains the plant-based feed additive Digestarom® to naturally improve feed intake and digestion with essential oils, herbs, spices, extracts and flavors. Formulated with a unique combination of milk protein and the modified soy flour Glymaxene® for performance equal to all-milk products. It also contains beta glucan for optimum gut health and immunity. This milk replacer conveniently comes agglomerated to mix quickly and stay in the solution. Seasonally available with the insect growth regulator ClariFly® to help control fly populations. NOTE: Always offer free choice water. Large Breeds (120 lb of body weight): Feed 2.3 quarts twice daily (fill 2 quart bottle to rim). When mixed and fed according to directions, 45 milligrams of lasalocid will be provided per 100 pounds of body weight daily. Feed during periods of coccidiosis exposure or when experience indicates coccidiosis is likely to be a problem. Thoroughly mix milk replacer powder in warm water, and feed immediately. When preparing large batches (i.e., anything other than individual calf servings) keep the mixture agitated while dispensing into individual feeding containers to prevent any settling which could result in the feeding of improper levels of lasalocid. See General Recommendations on bag. CAUTION: The safety of lasalocid in unapproved species has not been established. This product is to be fed to calves only. Do not allow horses or other equines access to feeds containing lasalocid as ingestion may be fatal. WARNING: A withdrawal period has not been established for lasalocid in pre-ruminating calves. DO NOT USE IN CALVES TO BE PROCESSED FOR VEAL. DO NOT FEED TO LACTATING COWS.